Formula E has released the first sketch of the new Formula E race car. The design work is being done by Dallara. I didn't get any information along with the sketch. Until now the only images we've had for Formula E was the old Formulec electric race car. Given that Frédéric Vasseur led Formulec, and is leading Spark Racing Technologies (SRT), it was fair for us to have shown the Formulec car in previous coverage. 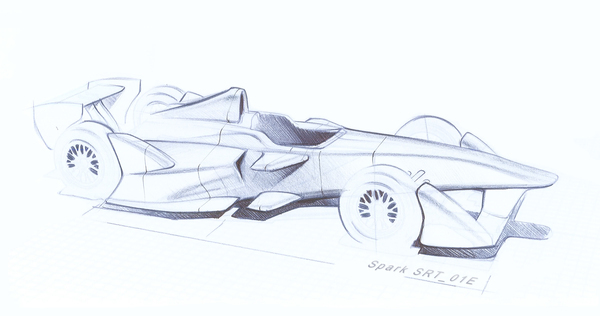 However, this sketch is giving us a glimpse into the car design which will race in the Formula E series. The name shown is Spark SRT_01E. It's an open wheel design, an open cockpit, several wings for aerodynamics, an air intake, etc. Looks like a race car. The plan is for Spark Racing Technologies and McLaren to team together in building 42 race cars for the 2014 season. These will be made available for race teams as well as for testing. So where is that air intake for than? I can imagine some minimal cooling is required but a clever designer would place heatsinks of motor controllers in free air which would leave only the motor to be cooled.